It starts by heating up a kettle of water. While it comes up to temperature, I unload the clean dishes from the dishwasher, clean out the French press, feed our betta fish Drake, open up the windows and fill a giant mason glass with lemon water. Then I set up my mise en place. Ground coffee goes into the French press. I’ll take down the Bulletproof Vanillamax powder, ghee (clarified butter) and MCT oil from the cabinet, assemble the hand blender, and find two mugs, a big wide-mouth mason jar and a measuring spoon. By that time, the kettle water is ready to pour into the French press. While it steeps, I meditate with my Muse headset. Then I return to the kitchen to incorporate the ingredients in the mason jar and blend them to frothy deliciousness with my hand blender. 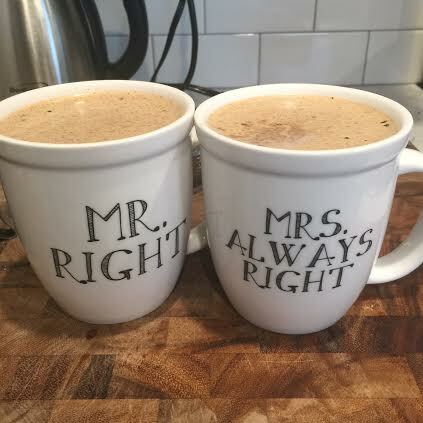 Next, the real magic happens: my husband Mike and I enjoy our coffee together and have our morning team meeting. The two of us talk through our respective schedules for the day, optimizing and strategizing as necessary, and then identify a few key things we each want to accomplish before we reconvene. My current buttered coffee setup. Vanillamax powder, MCT oil and ghee. 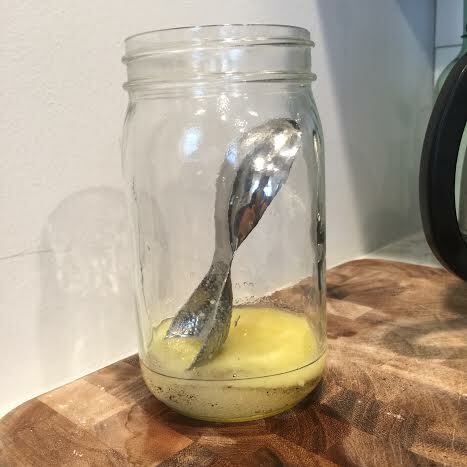 I leave the spoon in there so that as I pour the coffee into the jar, it melts the remaining ghee off the spoon for easier cleaning. On the left, the finished, blended and frothed coffee. I’ll top this off with the remaining coffee, give it one final blend and then pour it into the cups. Breakfast for two, ready to go. Your most important team is the one that lives in your house. Maintain growth and momentum there, and it’ll carry you through everything else you do in the day. Checking off to-do list items feels good, but starting every day by focusing on mutual growth feels even better. This morning ritual helps Mike and I remain aligned, even though our day’s activities couldn’t be more different. Building on the success of this first team meeting, we’re now testing two more: a noon check-in and a post-workday walk (more on those in a future post). Switching to Bulletproof coffee in the morning has been transformative: we get energy and mental clarity that sustains from 8 a.m. until 2 p.m. - 4 p.m. Because we’re not hungry for lunch, we now use that time to exercise, meditate, or just take a break. Divide the morning labor. I wake up earlier, so I make the coffee, and Mike cleans up. Not only is this strategy faster, it’s also more enjoyable. Nobody wants to feel like they have to singlehandedly shoulder the responsibility of making a new habit stick. No multitasking during the team meeting. Work can wait. It can all wait. Have a set place and time for your team meeting. The meeting location should be a quiet, relaxing spot where you feel calm yet focused. During the meeting, be realistic about your day’s ideal accomplishments. Set targets for yourself that are achievable, versus what you think your partner might want to hear. End on a positive note -- even if that means you extend the meeting until you reach a positive note.